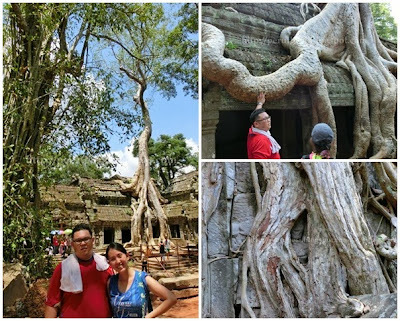 Some of you would have known that I've been on several trips since mid of this year, but never had the time to sit down & blog on those places (and the food offered, of course!). I now have the time to do so & in this post, I would like to share with you on the sights & tastes of Cambodia. 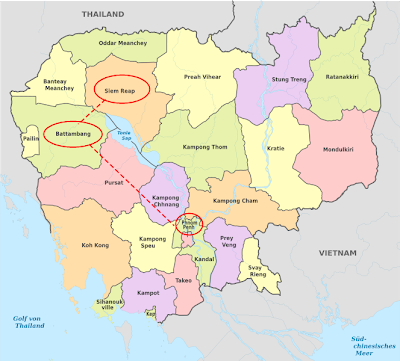 My family & I were in Cambodia early June 2013 & we did a 'country-tour', whereby our journey covered 3 of the major provinces in Cambodia i.e. Siem Reap, Battambang, & Phnom Penh. 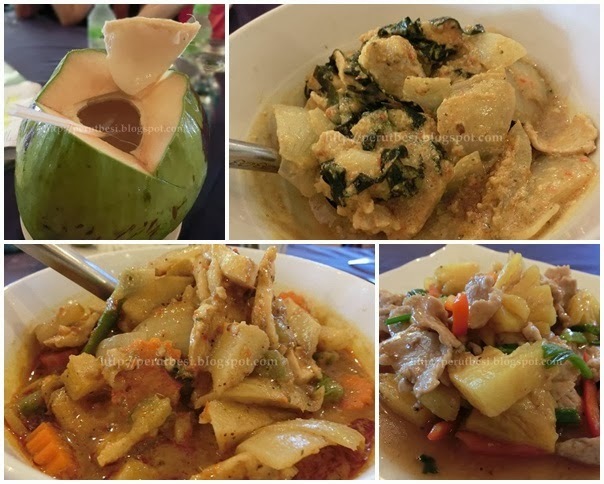 In this post, I'll share with you on the approximate budget, spots that we visited & the food that we ate as well. 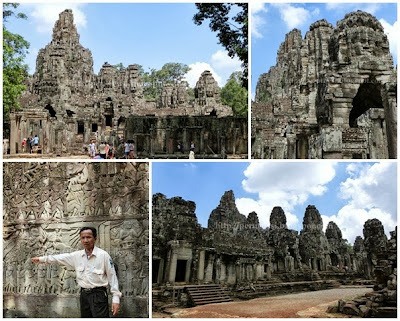 Do bear in mind that most of the tourist places in Cambodia are architectural buildings & temples. 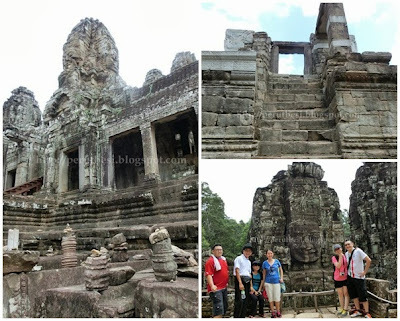 We did LOADS of walking & seeing the different temples although non of us are Buddhist/Hindu. 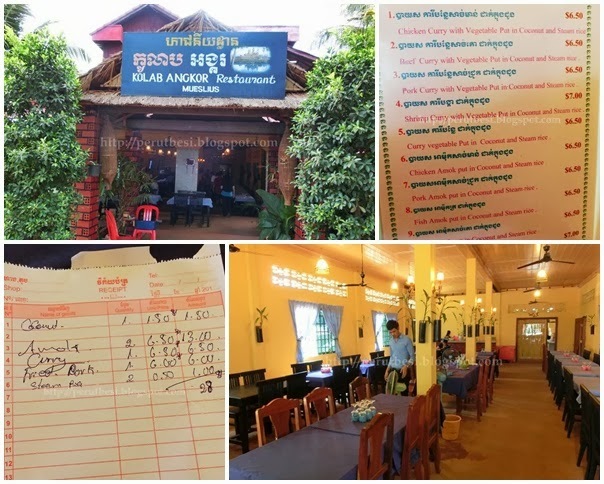 Upon arriving in the Siem Reap International Airport, we were greeted by our van driver, who took us back to the Khmer Cuisine Bed & Breakfast to "check-in". 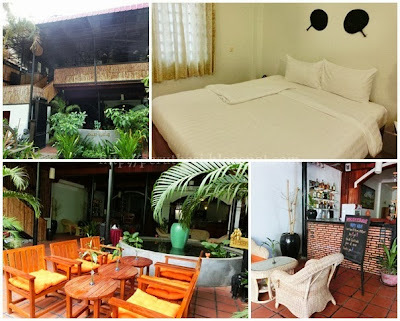 I found the hotel through Agoda.com & I'm pretty pleased with the place although it wasn't some "wow" hotel. It's a humble place to stay, with air-con rooms & clean beds. The hospitality provided by the staff were also commendable. I won't mind staying there again :) We left our bags there & started our tour with a simple breakfast nearby, followed by a whole day of sight-seeing. Note: I requested the hotel's help for tour + van arrangement. They're VERY helpful & it saved me LOADS of hassle. Prices aren't very different from engaging with a tour guide + transport myself. Once we're done with breakfast & energized for a whole day of walking (okay, maybe just half the day of walking), we left for the "Small Circuit" temples around Angkor Wat area by air-con van! It was REALLY hot & we're all VERY glad to have chosen the air-con van for 6 pax instead of taking 3 tuk-tuks. The 1st place that we visited was the Angkor Thom temple complex. 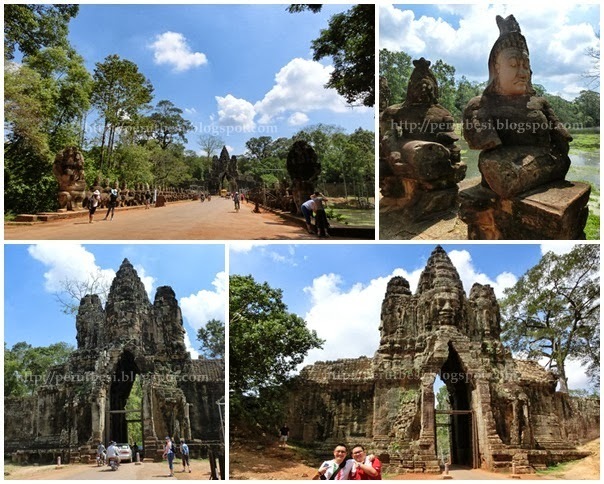 The entrance of the temple complex is 'guarded' by 1 row of gods (on the left) & another row of demons (on the right). 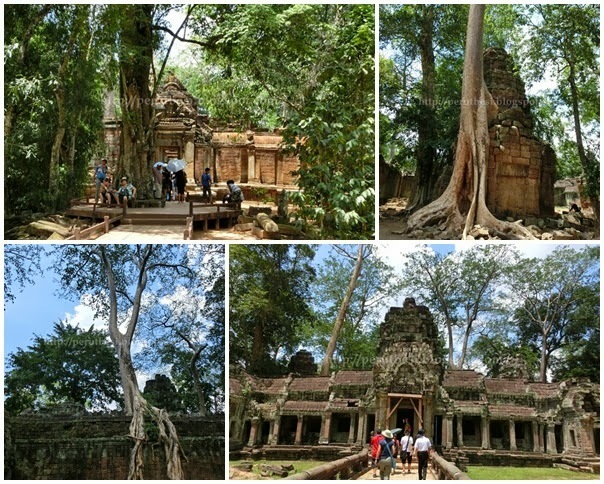 Ta Phrom is another Bayon-style temple complex. The unique feature of this temple complex that you will never miss is the tree roots growing over the walls of the temple. It's so 'jungly' & a good reminder that nature's forces are much stronger than any man-made items. Pretty comfortable environment with decent food. 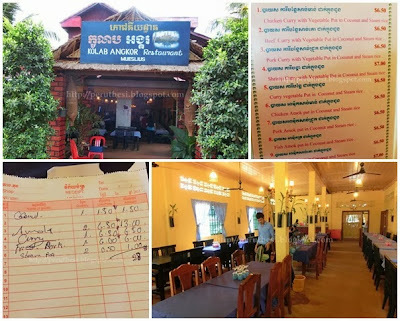 A rice set costs an average of USD6.50. Right after lunch, we were energized to continue walking & touring. 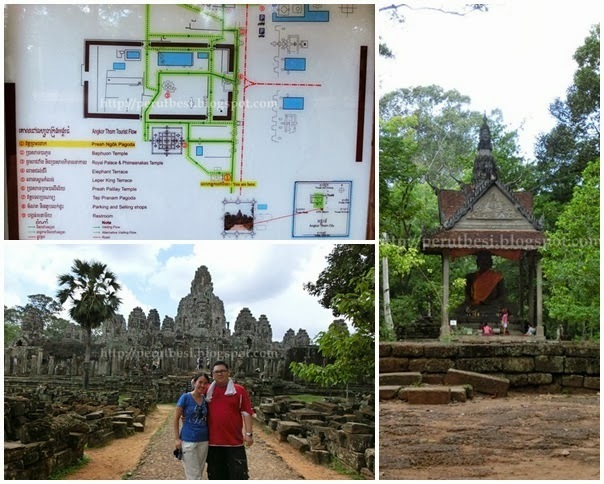 It's time for the highlight of the day: Angkor Wat! 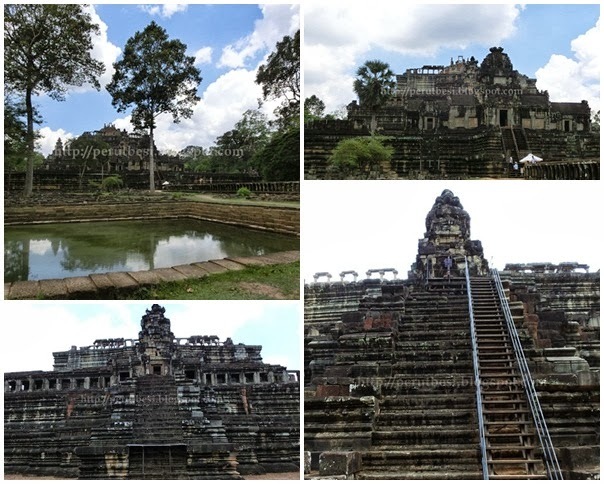 No explanation is needed as there are many articles written on this majestic temple complex, that was once a Hindu temple, which in the end was converted to a Buddhist temple. The carvings & structure of the building is just amazing - how many years it took for the whole complex to be completed with the technology of the olden days? :S Enjoy the photos! At certain angles, you can view more 'stupas' or peaks of the temple. There should be 5 peaks. Looking back at the hundreds of photos that I took brings back lovely memories of the trip. It just amazes me how the people in the empires & kingdoms of the olden days are so clever & 'spiritual'. Everything in their life resolves around gods & temples. Kings are revered as they are looked up as representatives of god. Stay tuned for the next post on Day 2 in Siem Reap! Guest post: Woods Bio Marche – heaven on earth for vegans in KL! 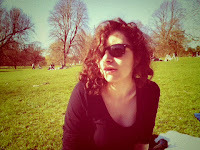 This is my 1st time having a guest blogger on my blog! Put your hands together & welcome Edith McMan, blogger of Apples on Sticks, who will introduce a vegetarian restaurant in KL to all readers of The Ruthless Eater :) Enjoy her write-up! c) too spicy for me. But thanks to my friend, I discovered Woods. Woods has a nice, relaxing ambience in addition to serving vegan and healthy food. You get to enjoy Asian food as well, such as Dim Sum and Miso Soup, but my all-time favorite has to be the Soy Burger, which consists of a Soy patty, salad and a delicious sauce. For a warm drink, you might want to go with the soy cocoa. I also tried and loved the tahini sauce noodles, and the corn rice. 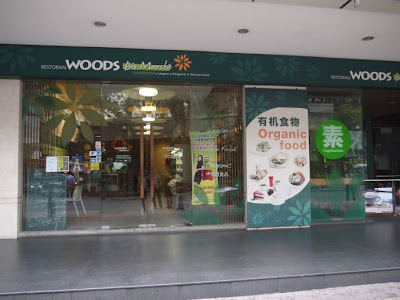 But the whole experience doesn't end when you leave, because Woods features an attached shop where you can buy your organic fruits, vegetables, seeds, pasta etc. Pretty awesome, right? As far as the setting goes, the whole place has this feel to it that calms you down as soon as you enter. The door chimes cling as you open the door, and the staff welcomes you. You can choose your table, and all of them are large made of sturdy wood, with comfortable seats. A row of mirrors cover the wall on the inner wall, and there’s no distracting music being played, which has a calming effect. You get your menus and you’re ready to order; depending on what you order, you get to improve the health of your body. If you had a rough night in the weekend, go for something like Liver food. And if you’re looking for a refreshing drink, go for the Lemongrass water! So if you’re in KL, I say try it out! 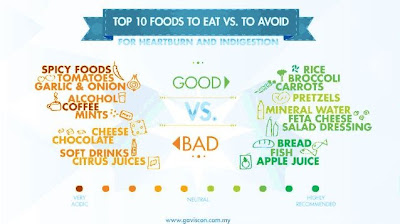 Woods is such a nice place, you can enjoy the food, the ambiance and the service, all the while being sure that you get all your nutrients and you are full, too. It’s very centrally located, in Bukit Bintang, and easily accessible. As the name predicts, it’s a natural place with natural food in a natural environment. Business hours: Daily 11:00a.m. - 9:00p.m. Edith always liked to write and has an opinion about almost anything. Therefore, it only occurred naturally that she started up her own blog, with the latest being applesonsticks.com, where she posts random stuff about her broad interests. She is currently working in Kuala Lumpur, Malaysia, which inspired her with a lot of new thoughts to share, especially about food. Celebrate this mid-autumn festival with Casahana's extensive variety of mooncakes. From the traditional pure lotus seed paste to the modern pomegranate, yam, & more, people from all walks of life will be able to find something that will suit their preference! Be spoiled for choice with the 16 different flavours of mooncakes, with prices ranging from RM14.90/mooncake - RM17.90/mooncake. Overall mooncake: Thin layer of mooncake skin covering a generous portion of smooth & sweet filling a.k.a. 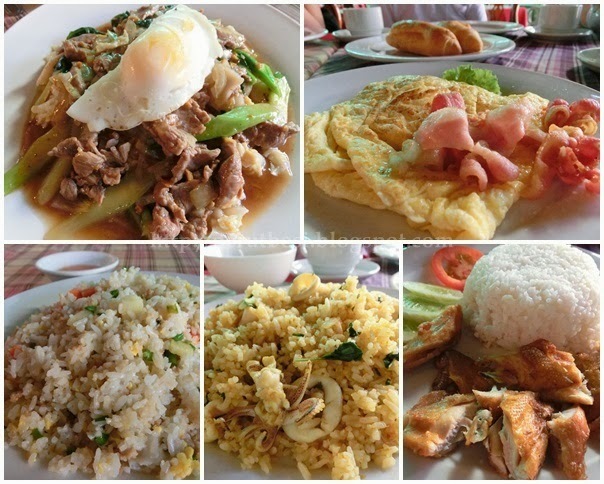 "pei pok ham leng' (Cantonese)! It's not too oily (VERY important factor for me), not too sweet, & not dry - perfect! Price: Standard - it's not more expensive than its competitors, but the quality of the mooncake is indeed commendable. A classic favourite that most people will go for - the pure lotus with 1 yolk. Somehow having a pure lotus mooncake with 1 yolk is a must in a box of 4 :D Salted egg yolk with sweet lotus paste is just delicious! I'm a fan of pandan-flavoured lotus paste & this particular flavour came with a 'custard' center that resembled the salted egg yolk. It's a good choice for those who don't like the egg yolk or prefer to have something with lesser cholesterol. Check out how thin the skin is! The green tea filling is actually quite nice, but as I'm not as fan of red bean paste, I find the red bean paste center not very appealing to my tastebuds. The red bean paste was also slightly 'grainy'/coarse as I think it lacks oil. I felt that this was one of the 'weirdest' combination of mooncake that I've eaten. I can't really taste the pumpkin nor the taro when I eat it together. It's my least favourite among the 4 flavours in the box. Casahana Mooncakes are available at all major supermarkets in KL, JB, Penang & Singapore. Enjoy!